Regardlesssmall size jewelry items can add spice and charm to your look. Besides you can change the mood of the same outfit depending on the accessories you choose to wear. US-based label J.Crew knows the significance of these small items for creating flawless and chic looks. The brand launched an array of original accessories in bold hues just in time for the summer season. Beautiful and fresh Mona Johannesson was chosen to model the items from the latest J.Crew Spring/Summer 2013 jewelry collection full of chunky pieces in bright shades that will not only add individuality to your looks, but also enhance them to the totally new height. Obviously Iris Apfel’s passion for bright hues and large sizes served as a base for these J.Crew jewelry items. I prefer fun jewelry with big stones – so large they would be untouchable if they were real. 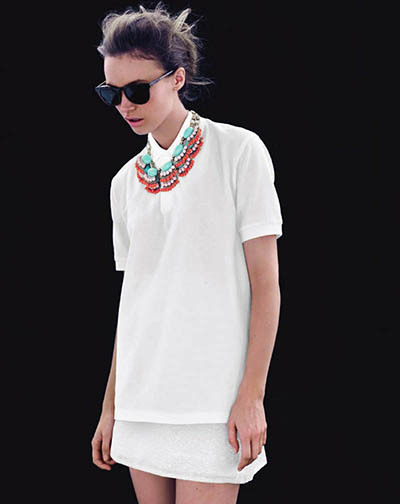 So, it was no surprise that in this J.Crew Spring/Summer 2013 jewelry collection an accent was made on the large scale stones and bold hues that add a splash of color to the plain outfits in crisp white as shown in the lookbook. The collection includes chunky chain necklaces and bracelets in gold, bright-colored necklaces with stones, statement rings – items that will definitely bring spice to your looks and add a playful feel to them. Along with the chunky jewelry items, this J.Crew collection includes an array of delicate and more subdued pieces for girls who prefer feminine and minimalistic style in clothing. Once you purchase any of these beautiful jewelry pieces, you will be able to style your everyday outfits in the best possible way.